A bicycle is pinned under a vehicle after an accident this week. Urbana police are investigating a Wednesday crash in which a youth cyclist was injured. 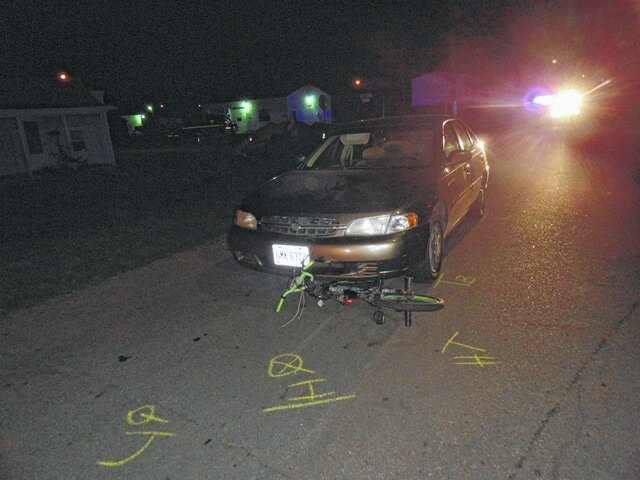 According to Urbana Police Chief Matt Lingrell, police and the Urbana Fire Division responded to an injury crash involving a 12-year-old bicyclist who collided with a car within the intersection of Orange Street and Harmon Avenue at 8:46 p.m. Wednesday. The cyclist sustained serious injuries and was transported to the CareFlight hangar, then transported to Dayton Children’s Hospital. He was listed in good condition as of Friday afternoon. A preliminary police investigation showed the cyclist was not wearing a helmet and was riding northbound on Orange Street when he failed to stop for a stop sign at the intersection of Harmon Avenue and rode into the pathway of a westbound 1999 Nissan causing a collision. Police believe the vehicle, which had just turned out of a nearby alley, was traveling at a relatively slow speed at the time of the crash, but that the impact caused the cyclist to be thrown first onto the hood of the vehicle and then off the hood to the street as the car stopped suddenly. The driver of the vehicle and three passengers were not injured. https://www.urbanacitizen.com/wp-content/uploads/sites/36/2015/08/web1_crash.jpgA bicycle is pinned under a vehicle after an accident this week.